Pencil can show shadow really well. I like this, but I think you need to smudge more. You smooth the shadows with a piece of wood or your finger. Or use Photoshop if you can, and don't want to change the origional. Thank you for the advice. ^_^ And the comment. 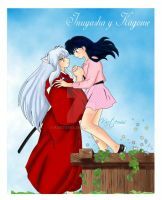 Omg... you so kill me when it comes to drawing Inuyasha. Very nice! Love the smile and the one tooth.. too cute ^^ The hair is also nice; your shading is well done for a pencil. oops srry that i sent it twice. aw its sooo cute....i love inu. its a very awsome pic of him. aw its sooo cute...i love inu. very awsome pic of him.